The United States government may have officially withdrawn from The United Nations Educational, Scientific and Cultural Organization (UNESCO), but at the USDAC we stand with UNESCO and for the #RightToBelong through language and culture. Today, along with UNESCO and member countries around the world, we celebrate International Mother Language Day. We call on Citizen Artists everywhere to take a stand for linguistic diversity and language justice. Here are a few ways you can you take action toward belonging through language justice—the right for everyone to communicate in the language in which they feel most comfortable. Download or revisit the USDAC’s policy and action platform, Standing for Cultural Democracy. The platform is a ten-point compendium of ideas and approaches to nurture cultural democracy. It includes a template Cultural Impact Statement and a Policy on Belonging, both of which could be used to support and protect linguistic diversity in a community. Challenge yourself and invite others to promote language justice where you are by activating one of the toolkits below. Each provides practical tools and tips for adopting inclusive language practices in your organization or community. Learn about the variety of languages spoken in your community—and advocate for multilingual education practice and policies at your local schools, libraries, and other public services. See the bigger picture by learning more about the world’s endangered languages and why preserving them matters for our shared human future. The NYC-based Endangered Language Alliance offers a great overview. Cultural rights are only made real when we dedicate the energy and resources to supporting, promoting, and protecting them. Thank you for your efforts! And, as always, reach out at hello@usdac.us if you have any questions, comments, or just want to connect. At the USDAC National Cabinet meeting that preceded CULTURE/SHIFT 2018 (the people-powered department’s second national convening), a Cabinet member remarked that we have uncanny timing. The prior CULTURE/SHIFT took place just ten days following the 2016 Presidential election; and though few of us foresaw the outcome, all were grateful to be welcomed into a supportive community of people from many places who shared a commitment to culture as a path to equity, justice, and love. This time, when we gathered on November 1st in Albuquerque for CULTURE/SHIFT 2018, another election was just a few days away, and in a moment marked by intense organizing and mingled hope and fear, the mood of the body politic was divided. We are people who place our gifts at the service of community, equity, and social change. We are more powerful than we think. This weekend, as CULTURE/SHIFT-ers and USDAC Citizen Artists, we are that diverse, inclusive, beautiful group of people who is figuring out how we use our gifts in creativity, arts and culture to live together. I invite you to take this energy and vision we collectively create this weekend back home with you into your homes, schools, neighborhoods, cities, states, and regions so we can show up as our whole selves to make U.S. who we really are and who we really want to be. Welcome! Welcome! Welcome! Once again, we’d been welcomed into a true community, and the mood shifted. A path opened at our feet, marked by farolitos (sometimes called luminarias), small candles protected from the wind by paper bags. Carrying them, we wound our way into the convention center for a performance especially created for the occasion by The EKCO POETS— Maiyah King, Valerie Martinez, Michelle Otero, and Mónica Sánchez. And CULTURE/SHIFT 2018 had begun! It was a full and rich three days, sold out with nearly 400 participants from the Southwest and around the U.S. taking part in more than 50 workshops, two plenaries, opening and closing ceremonies, and a culminating dance party. You can find a list of all the sessions here. Many of them were recorded on audio or video: scroll down on this page for a complete list. The Facebook album can be found here and there’s a great selection of photos on our website here. CULTURE/SHIFT 2018 was infused with ancestral invocation and healing, participatory song, pop-up play, tools for making change on a neighborhood, city, and state-wide level, policy deep dives, movement and embodiment, calls to action, delicious food, cultural strategy, radical imagination, deep connection and listening, and raw honesty about both the grief and fear and the hope and possibility of these times. With so much to choose from, it’s hard to know what could capture the spirit of CULTURE/SHIFT for those unable to attend, other than to say it was all ages, cultures, faiths, genders, abilities, all learning, all belonging, all engaging, all the time. “This Moment: A Community Plenary,” the opening session on Friday morning, November 2nd, expressed it well. You can watch the entire plenary on Facebook video here. After an acknowledgment of Tewa lands by Daryl Lucero of Isleta Pueblo and welcomes by Shelle Sanchez, Director of Albuquerque’s Department of Cultural Services and by USDAC Chief Instigator Adam Horowitz, one by one, six powerful Citizen Artists offered us five minutes each of deep sharing, and in between each pair of offerings, we turned to our neighbors to share our responses. After another dialogue interlude, Lulani Arquette, Catalyst for Native Creative Potential on the USDAC National Cabinet and CEO of the Native Arts and Cultures Foundation, shared that her ancestors were kahuna kalaiwa'a (master canoe carvers) and her great-uncles paddled with Olympic champion Duke Kahanamoku. Providing context for “I Ku Mau Mau,” a powerful Native Hawaiian chant she taught, she explained that it embodies the values of persistence and community embedded in the communal search for the right tree and the massive participatory process of bringing it home and turning it into a canoe. Our gratitude to all who planned, prepared, presented, brought their hearts, souls, and minds to the convening, and together, welcomed each other home to CULTURE/SHIFT 2018! May all that you gave be returned to you a hundredfold! The original idea was to integrate arts-based approaches into the Philadelphia Planning Commission's Vision 2035 NW Philly planning process, building on a “successful multi-generational, resident-driven story and theatre-based pilot project we created with and for Germantown United Community Development Corporation.” The proposed project would once again bring together local residents “who were trained in generative listening, story-circles, community-driven story analysis, and Just Act's performance "gift-back" technique, and who facilitated community events,” acting as a kind of bridge between planners and the community, using stories and documentation to let planners know what Germantown residents want. The proposal was inspired by Platform point 6: “Integrate community cultural development and the work of artists into all social programs affecting culture.” As Lisa Jo’s proposal noted, Just Act would be “incorporating our art skills and experience into a community development process that normally shies away from intensive community in-reach. Community developers have told me that they don't have the time to get involved in 'that kind of thing'—let alone creative strategies for engaging residents,” a problem that will be familiar to many who work in community-based arts and culture. An underlying aim of Just Act’s Policy Prototype project was to “use the arts to hold CDCs and City Planning accountable to residents,” working to ensure that decisions affecting a neighborhood were shaped by residents. Like all of the projects in the Policy Prototype series, the idea was to offer a model, in this case for planning commissions and community development folks in Philadelphia and beyond to integrate arts-based planning methods into their ongoing practice. For example, Mark Harrell, who was the neighborhood advisory committee coordinator for Southwest CDC, is working with Just Act to integrate arts-based strategies into a big project that HUD and the Philadelphia Housing Authority are doing in Southwest Philly, building a new mixed-income housing development. Because our work transformed their meetings into self-revealing visioning opportunities for the residents to see and identify and experience the power of we, he would like to bring us into the organizing group that is being formed, to be an integral element of the community planning for that project. I asked Lisa Jo to share something about the ah-ha moments that inspired people who’d been involved in conventional planning approaches to move towards arts-based approaches. Well, the framework honored in a tangible and visible way the people who were in the room and how they were connected to their place. It led them to new insights into their roles as individuals in relationship to the collective. Our country socializes individuality and not a sense of compatibility and collectivity. So this was an opportunity for them to discover themselves in relationship to themselves and each other. It was a process of engagement that none of the NAC coordinators had ever experienced and they all loved it. They were sad that we were not able to get the funding to continue it. We only had four sessions at each NAC. There's a lot of trust-building and understanding and embracing the complexity of each group and then utilizing arts-based techniques to respond to emergent needs. They had all risen to a place of readiness, honoring their differences while embracing their shared experiences. It’s hard to have been put on pause because the resident relationships and knowledge and community awareness were really on the upswing. [M]et at a police athletic center building that has been disinvested from but is brimming with abundance in terms of the people there. One community elder coined the term “the power of we” because they all love the place and sense of place is connected to people, process, and place. So how do memories of the place create a sense of self through people’s individual meaning-making but also the group-level community experience, social identity and self-identity. From every neighborhood we heard things like “I love this place,” and simultaneously a sense of loss about how the neighborhood has changed. In terms of place, what is the attachment? What is it about the physical space that supports this bond? We heard a lot about neighborhoods supporting community ties; people identified physical sites that supported health and well-being. All together this revealed their sense of place. Using arts-based strategies with primarily non-artists affords the opportunity for them to see that they are creators, that they can make the invisible visible and really embrace the power of their imagination. By increasing awareness of their voices and missing voices and the social isolation that they may have experienced, there was a shift from NIMBY to NIOBY— not in my backyard to not in our backyard. We sought to bring people together across sectors not just for dialogue and expression but to grow new kinds of partnerships, shift both the CDCs and the artists in the neighborhood out of their silos to recognize that they have knowledge and insight when coming together about seemingly impractical challenges, that they are the solutionaries for change. I was able to bring a photographer two times but it’s got to be somebody who's sensitive to community organizing because we're growing the capacity of residents to steward the community's values even as they're figuring out what they value. We have a tiny bit of video from one of the events because one of the participants is a filmmaker. But the tech part is something that continues to challenge as we continue to try to find also the right language for cross-sector partners to understand what we do. I asked Lisa Jo for advice on building relationships with CDCs to open the door to arts-based work. It helps that I was the artist who was behind Chester Made and that became quite successful, although we haven't been part of it since the first year. It’s like a dating game, a courtship that has to happen. We've been building a partnership with the CDCs for over a year and they still don’t have the money to scale it up. And it’s hard because we're not a big theater company. But it's really exciting when I listen to the heads of the CDCs and NACs speak on behalf of Arts-Powered Places, to have them be the ones putting the arts-based work on the table and not me as the artist. It's an acknowledgment that this is a tool they want to move forward with. If you’d like to explore bringing any points in Standing for Cultural Democracy to life in your community, please feel free to contact us at hello@usdac.us. While Policy Prototype micro-grants were a one-time thing, we can still offer technical assistance and help share information with the wider world if you have a project that promotes one of more of the Platform points, so call on us. As we approach the centennial of the massacre in South Phillips County, our goal is to partner with individuals and organizations throughout the region to create a theatre event that unearths this erased and contentious history and considers how it has affected the communities past and present. Furthermore, we will raise Dr. Martin Luther King’s timely question—where do we go from here?— tour the play during the 2019 centennial year, organize an annual residency that will continue after the theater event, offering local artists opportunities to create their own self-determined work around issues of memory, reflection, belonging, and cultural citizenship." The big picture is that we're producing six residencies over six years. The first two are trailblazed by Remember2019, beginning with a blues event featuring local musicians using their music to synthesize personal stories and testimony with the rich history of the blues in the Delta. The next residency is the original, full-length play featuring community testimony and community and professional actors on stage. Then the next four will be determined by local artists. We are part of funding those residencies and getting a group of local folks together to take on those residencies past our involvement in the community, creating a long-term artist residency in the neighborhood. During the two months we were in South Phillips County we found ourselves wondering, “Where are the young people?” There’s nowhere to hang out. There's no public space to let loose and relax and see friends other than going to church. How can we create space for that? How can we provide food and entertainment and make a space where people can just hang out and commune? All of our work, both the story-sharing institute as well as the current blues festival, has conversation at its core. We are interested in reflecting on the story-sharing practices that remember that moment in time and how that has been affected and where that has been channeled. There's some research at the institute that the blues changed in response to the red summer of 1919, for instance. So all of that's in the mix of thinking about the dream for the play next year. Mauricio noted the nuances and controversies that commemorative justice projects can entail. “The Elaine Memorial Foundation is putting up a memorial and there are a series of events that are being organized for next October. And so how are we doing something that adds to that conversation? That puts up against it? That isn't just the same thing? How is our work refracting, reflecting on, reckoning with the conversation that is already happening in light of the memorial that's being created? Ashley and Mauricio explained that their team has been in conversation with all kinds of local groups, from Waves of Prayer to the Delta Community Center to the Boys and Girls Club, local educators, social service organizations, and beyond. What binds our work and theirs is a desire to have this story told on a national level, to give voice to these stories, and understanding that art and theater is the way to do that. People tell us “We're trying to move our community forward and we need this story to get out and we need attention to come here. We need jobs to come here. We need work to come here,” and the understanding is growing that theater as a vehicle for storytelling can serve those purposes as well. …says to me, “I feel funny. I don't know what this has to do with your work.” And I said “Listen, Kyle, we are in for the long game of supporting the development of the arts in the area. So helping you write this grant is also my work.” We are showing up as much as we can for the community and the community's needs, checking at the door our own particular agendas or even our own abilities. In that way I think this project will continue to morph. We will continue to produce these events, and that will be a centerpiece of our work. But also a whole lot of other things, because it’s going to take participating in many things. Remember2019 has received funding from Alternate ROOTS, the Highlander Research and Education Center, The MAP Fund, and the Network of Ensemble Theaters to support this long-term cultural development in the service of commemorative justice. Remember2019 Collective members Carlos Sirah and Mauricio Salgado are collaborating with James “Gone for Good” Morgan, Marcus “Mookie” Cartwright, and Vera White to present Black ‘n da Blues: Stories and Songs from the Arkansas Delta. The event is free to the public and will include a reception with food. In Black ‘n da Blues, Phillips County musicians explore the relationship between legacies of race and artistic expression – locally, nationally and beyond. The event is being produced in partnership with The Delta Cultural Center, The Elaine Legacy Center and The Boys, Girls, Adults, Community Development Center (BGACDC). Major events like these emerge from a fabric of community dialogue and story-sharing. For example, Remember2019 Collective members Arielle Julia Brown and Carlos Sirah convened a two-day story-sharing institute on 18 and 19 June, inviting local people to share “freedom songs, delta blues traditions, oral histories, meal centered oral traditions, story circles, testimonies, gossip, folklore, interviews and more,” culminating in a Juneteenth Freedom Celebration in a local park. "What's your investment in the work?" She would question us whenever we would say “We’re here for you.” Towards the end of our last time together, she heard us start to say “We're here because we want. We want." She says, “I only trust people who are here 100% for themselves because how do I know that you're committed unless you too realize there's something here for you?" That’s the level of commitment we’re being asked. “Playback Theatre” is a type of interactive improvisational theater work that has attracted practitioners around the world (learn more here). It is often used in group work to address conflicts and spur dialogue. In her Policy Prototype proposal, Heidi Winters Vogel described a series of storytelling events in communities of migrant workers on the Eastern Shore of Virginia, places where the residents were often unaware of the extent of their legal rights and the groups that exist to pursue them. This partnership between Inside Out Playback Theatre at Eastern Mennonite University in Harrisonburg, VA (where Heidi taught theater for many years; she’s now at Wabash College in Indiana) and the Legal Aid Justice Center of Charlottesville, VA, yielded a Participatory Theatre with Migrant Workers Toolkit the Justice Center plans to share with other groups serving migrant workers. Our partner agency, Legal Aid Justice Center, is building capacity in the migrant worker communities for resistance to exploitation. The most persistent barrier the Center encounters is the workers' fear of seeking help. Inside Out Playback Theatre storytelling events provide a way for camp residents to share their stories and connect with Legal Aid representatives in a welcoming and safe atmosphere. Inside Out provides bilingual entertainment honoring the cultures and stories of the people laboring to feed the United States. Recognize audience members’ vulnerability. Some in the audience are documented and some are not but all are working at the pleasure of the American companies. They are one injury, complaint or reputation as a troublemaker away from deportation or worse. Accepting giving up control of the stories offered to the audience to build trust. Playback Theatre is in service to the stories and the needs (often unrecognized by company members) present. Also, serving the storytellers, not the goals of the partner organizations. The prototype project had already completed its first stage when Heidi applied for the Policy Prototype micro-grant. 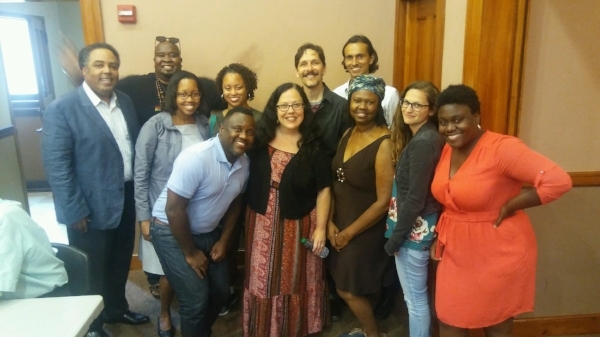 Inside Out company members spent several days on the Eastern Shore early in Legal Aid's outreach to summer agricultural workers, hosting bilingual storytelling events at two migrant camps and one trailer park—mostly Spanish-English but also Haitian Creole-English. Legal Aid found that residents were more willing to engage after these events, and definitely eager to have more theater experiences. Heidi stressed the vulnerability of migrant workers and thus the challenge of offering help. “For obvious reasons their positions are tenuous. They serve at the mercy of the large tomato-canning companies that work out there. A white person coming in and asking to work with them and asking questions about their time there and what difficulties they experience, they're reticent to share. When we asked them to share their stories by coming in to do teatro with them, it became a completely different environment. When we came back a second year it was even better because people remembered and invited their friends, so there was an even larger turnout. It really built on the work that they were doing." We primarily worked in two different kinds of locations. There are a couple of trailer parks where families would live and whole families would come. The other locations would be barracks where they would be housing the workers, primarily men but some women as well. This past year there were more Creole-speaking people from Haiti, though Spanish speakers were still the majority. As the current administration limits the amount of Central Americans coming into the country, more Haitians have taken advantage of the work. We don't have as much language capacity in Haitian Creole, so that is something we would like to improve. Openness to engaging with Legal Aid changed markedly. “The families are close-knit,” Heidi explained, “so there was a lot of celebration of the children’s achievement. And their food, lots of stories about what somebody had made and what they had contributed to a group meal and a celebration that emerged from that. It was so inspiring, that sense of community, because the food was something both the Creole-speaking group and the Spanish-speaking group shared. They talked about coming together to share each other's food, and they'd be like, "Oh, I want to try that." One challenge that Citizen Artists often encounter is conveying the value of arts-based organizing to those who haven’t experienced it directly. In the case of this Prototype Project, a member of the Inside Out company had moved to Charlottesville to work with Legal Aid, creating an organic connection. I asked how the company would start to build such a relationship in the absence of a natural ally. We've done a number of free events where we've invited different organizational leadership in the area. Legal Aid would’ve been a little more of a stretch because there’s not an office here. But that’s how we've gotten into the schools. That’s how we've gotten into other organizations in this area, by inviting them to come and experience it themselves. If the connections can be made the results were so incredibly profound—far more even than I expected them to be as a true believer in theatrical interventions. Even if it’s a friend of a friend, finding those community connections is the way. I wish I had a magic bullet, but I don't know what it is except talking to people and giving lots of demos. See it work, I’ve become an even bigger believer in the way we can build communities with this work. Cristina Cabeza Kinney’s Policy Prototype proposal called for a “Belonging Bandwagon” project in Crestone, a tiny town in southern Colorado best-known for the large number of Buddhist, Hindu, and other spiritual centers in the area. Speaking to Platform point 5—Invest in Belonging and Cultural Citizenship and Platform point 8—Adopt a Cultural Impact Study—Cristina highlighted the challenges of collaboration between Crestone, a municipality of around 150 residents, home to the commercial district serving the whole area including the much larger adjacent Baca Grande subdivision with about 2000 residents, managed by a homeowner’s association. Partnering with the theatrical group Company of Players, Crestone Town Board of Trustees, Crestone Creative District, Awakening The Phoenix, and Blue Earth Design, engage it they did—with a spirit of wildly performative fun. Cristina and other core Belonging Bandwagon team members took on the role of time-traveling “exploradoras” embodying an aspect of cultural inquiry: Juana Azurduy, a Bolivian guerilla leader (Cristina Cabeza-Kinney), Harriet the Falconer (Kelly Hosner Crowley) and the poet Sappho (Allison Wonderland), all three characters previously featured in the Company of Players production Herstories). A sketch for the belonging bandwagon, a movable repository for stories, resources for making things, and printed information. 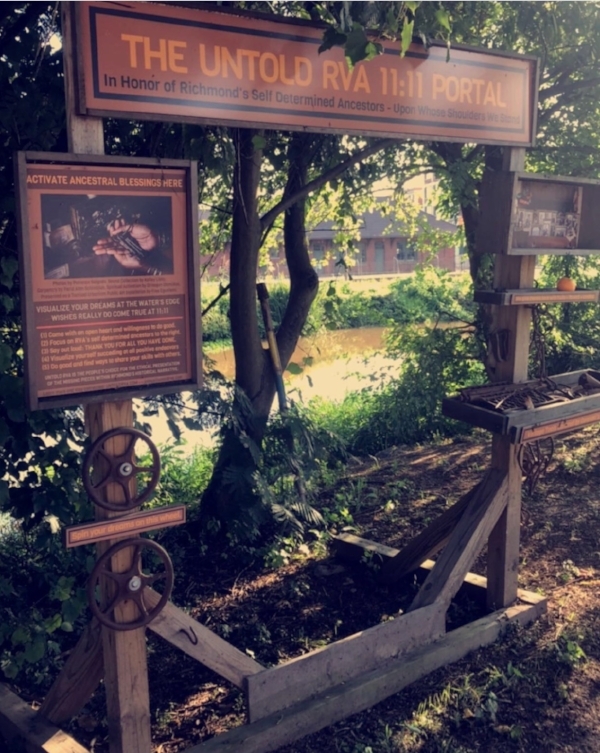 In the performance, audience members learned that the three explorers “fell down through the Charter Portal as we were summoned to Crestone by local story weavers…. As we prepared to travel back up through the portal, while shaking our heads and waving our farewells, we discovered the portal was shut to us. Anti-gravity aerodynamic lift interference with spacetime tessering entanglement, apparently...obviously. Just then a grand voice boomed saying, ‘To find your way through, you must work to include, discover the clues and fill the bandwagon with home.’” Clues came in the form of interactions with locals and a set of keys that magically appeared, each unlocking a different aspect of belonging. Juana told the audience that “we discovered that the common theme in all of these key clues is STORY! We then wondered what are the actual stories of culture and belonging of the people who live in this village of Crestone? And this is what has brought us here today to be with you!” After collecting stories from audience members, the trio invited everyone into Story Circles to help design the Belonging Bandwagon, a multi-purpose wooden structure on wheels; to populate the Crestone-Baca Sense of Belonging Book, one of many artifacts the Bandwagon would hold; and to consider ideas such as the Policy on Belonging and Cultural Impact Study, putting humanity into policy. Sappho, Harriet The Falcolner, and Juana Azurduy exploring with the people of Crestone-Baca. After the performative phase of the project, the team showed the video to the Town of Crestone leadership, presenting 25 letters of interest from local folks who wanted more engagement in community and belonging, and offered the Cultural Impact Study as a model Crestone might adopt. They also began conversations about bringing the same issues and policies to the Baca Grande Property Owners’ Association, where two members of the core team live. Starting with young people, teachers, and artists at the James Simons Elementary School, the project developed interactive, map-based “Imagination Stations” (a concept the USDAC piloted in our October 2015 National Action, #DareToImagine) to be installed as part of a five-week exhibit and public program at the City Gallery (run by the City of Charleston Office of Cultural Affairs) in the summer of 2017. A free downloadable catalog of the exhibit, including many images and texts, is available here. The Collective comprises Debra Holt, Gwylene Gallimard, Pamella Gibbs, Jean-Marie Mauclet, and LaSheia Oubre. They are artists, educators, and activists who’ve teamed up to engage the greater Charleston community through art, building awareness and action to address escalating displacement as both the cost of living and local development and zoning policies push many lower-income residents out of longstanding neighborhoods. They’ve been working together for quite a few years. For example, read about early work here, including the “You Comin’” project, documenting first encounters catalyzed by the Collective at the World Social Forum in Nairobi in 2007. The name conNECKted was chosen in 2014, when the city released a document entitled “Partnership for Prosperity: A Master Plan for the Neck Area of Charleston and North Charleston,” land between the Ashley and Cooper rivers, from the Arthur Ravenel Bridge to I-526. 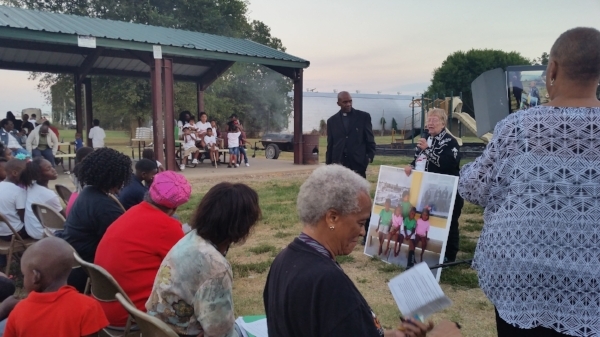 Community meetings were sparsely attended, raising concerns about whose voices were included and whether the real planning agenda was to develop prime real estate, with the Neck’s African American residents displaced as economic collateral damage. How would Charleston be different if new construction and development projects, rezoning decisions, and "Creative Placemaking" interventions had to pass a Cultural Impact Study (CIS)—analogous to an Environmental Impact Study-before approval? Right now, when authorities consider whether to approve such initiatives, they think about money (who profits?) and environmental impact (will endangered species habitat be negatively affected? Is there potential pollution?). Sign this petition to say that Charleston should adopt a CULTURAL IMPACT STUDY requirement, assessing potential negative impact on social and cultural fabric. How will the proposed development affect the meeting-places, sites of public memory, embedded history and meanings people have invested to make their neighborhoods vibrant and welcoming? What about the rights of existing residents to remain in their neighborhood if they wish? Every community should be authorized to access, study and act on these too. Whether the potential impact is gentrification and displacement or outright destruction of existing cultural fabric, the purpose of a CIS is to help public officials make informed decisions. If they find negative impact, a CIS would equip authorities to disallow proposed projects or require amelioration before things can proceed. Sign this petition to say you have a right to a say in Charleston's future: Culture counts, History counts, People count—YOU count! As the official press release stated, “the goal here is to realize that, in this era of displacement and denial of history and culture, ‘Belonging’ is the key to empowerment and transformation, the cornerstone of our present and future realities.” Petitions have been delivered to key city officials, and the Collective is exploring other ways to make Cultural Impact and Belonging official policy in Charleston. Petitions were just one participatory element of the project. For example, they brought pre-printed cards to Marion Square in downtown Charleston and asked people to write a note to the mayor, then sent one to the mayor each day for a hundred days. “That was our introduction into the City,” said Pamella, “because they wanted to know who's this group they've never heard of sending a letter to the mayor once a day.” A wallpaper of all the postcards was created and presented to the mayor six months later as a reminder. Serendipity was powerful in a project open to emergence. Auzheal Oubre, the brother of Collective member LaSheia, was in the gallery space during installation. He pointed out that buried under nearby shrubbery was a memorial for Robert Smalls, who escaped from slavery by commandeering a Confederate transport ship and went on to become a member of the U.S. House of Representatives after the Civil War. Making the memorial visible became part of the project, as did 96-year-old Samuel Joyner’s account of Charleston’s Mosquito Fleet of small fishing boats. “It was heartwarming,” LaSheia said. “Mr. Joyner came, and when he saw the replica of the boat and the video of himself, he just cried. It was beautiful watching him listen to his own voice and his own story.” Among the generations of Joyners who visited the exhibit was Samuel Joyner’s son Jermaine, who had been an elementary school student of LaSheia’s and was now principal of the school where she works. “That's Charleston,” said Pamella. If you’d like to explore bringing a Cultural Impact Study or the Policy on Belonging to your community, please feel free to contact us at hello@usdac.us. In November 2016—at CULTURE/SHIFT 2016 in St. Louis, just a few days after the presidential election—we launched “Standing for Cultural Democracy: The USDAC’s Policy and Action Platform,” ten points of intervention to help bring about cultural democracy, to nurture a social order of equity, justice, creativity, and belonging. We’ll be profiling each of these policy prototype projects, sharing documentation and interviews with the people executing them—so stay tuned! The first profile, focusing on the coNECKted project in Charleston, SC, was published today. How did the USDAC’s policy prototypes evolve? It all started with our policy and action platform. Standing for Cultural Democracy had been in preparation for many months before its November 2016 launch, with strategic questions multiplying in the run-up to the election. We doubted there was an immediate likelihood that any new administration, regardless of party, would support the kind of public service jobs program we called for in point one. After all, despite economic challenges and often-high unemployment levels, no Congress had seriously entertained a “new WPA” (to borrow a term from the 1930s New Deal that employed many artists through the five projects jointly known as “Federal One.”) In short, some ideas were planted as seeds that would need long-term cultivation. Others were immediately feasible depending on political will and public demand. The Policy on Belonging, Platform point five, calls for public and private entities to adopt a formal Policy on Belonging and four other initiatives to deploy artists in public space, making belonging real. The Cultural Impact Study, Platform point eight, calls for universal adoption of a requirement that the impact of public interventions and policies on social fabric and cultural citizenship be studied and harmful impacts addressed, analogous to an environmental impact study. We knew these could be adopted at local, regional, or national levels, but we also knew that the results of the 2016 election would have to inform strategy. How? My keynote speech for the plenary session launching the platform acknowledged the gravity of the moment. In retrospect, when you consider that we had no idea precisely what was to come, it takes on more intensity. “The challenges we face under President Trump—racism, homophobia, xenophobia, sexism, institutionalized greed, state-sanctioned violence, and every other form of predatory behavior—are not new. But the level of response is already astounding. We will be working in countless local communities to build on the courageous action already seen from mayors of sanctuary cities, leaders who have declared their refusal to normalize hate, vast numbers of individuals and groups who have already—less than two weeks after the election—taken action in the courts, on the streets, and in their own lives and communities. “Protecting and defending are urgent, essential priorities. The USDAC stands with all who are endangered by policies that deny belonging and further threaten the people. We stand to support and assist all those who are affected by the repression of rights. We will work with you to co-create a network of connection and support, to share skills in planning and executing creative resistance, and to bring as much attention as possible to your courageous work in kindling a shared vision of cultural democracy and putting it into practice. Whatever the future might hold, we knew in November 2016 that Citizen Artists were committed to cultural organizing at the local level, work that would continue regardless of who occupied the White House. To catalyze and document some of this work, we put out a call offering micro-grants for participatory, replicable “pilot experiments that show how the Platform can be put into action.” Just $500 per project was available to support effective documentation and help in some small way with the work. This blog series shares the completed projects with you. We hope they inspire you to find ways to implement Platform points in your own community. Right now—with the Supreme Court upholding the Muslim ban, basic cultural rights being eroded every day at the border, and an epidemic of phone calls to the police denouncing law-abiding African Americans for even showing up in public space—the Policy on Belonging (which has its own free, downloadable toolkit accessible here) seems especially germane and necessary. You can start with your own community. Consider asking your local house of worship, school board, neighborhood association, city council, or other group to adopt the Policy on Belonging, to commit to vetting their own actions for their impact on true cultural citizenship. Whatever you’re inspired to do, whichever platform points are related, please feel free to call on us for help at hello@usdac.us. USDAC Welcomes 10 New Outposts! A few months ago the USDAC put out a call for groups of Citizen Artists to form local Outposts committed to enacting USDAC values in their community. It’s our pleasure to introduce the newest Outposts to join our national network. These dynamic groups are situated in rural communities, urban centers, and college towns. They champion issues ranging from equal representation in the arts to creating space for artistic action based in love and care, to holding dialogue for community transformation, and much more. Among the sounds of the guards, it feels little by little that life is leaving us. Now there are more than 600 days without freedom and counting. My son asks me, "Mommy when are we leaving?" I reply, "We are leaving soon, I can take you soon, soon we will be happy outside. I pray and at night, I look through my window and I would like to touch the stars. I would like to become one of them. To shine in the dark and walk along with my son towards freedom. and I beg for his forgiveness. These are the translated words of a woman incarcerated at the innocuously named Berks County Residential Center, a family prison located an hour outside of Philadelphia. They are excerpted from Seguimos Caminando, a collaborative public artwork featuring stories written by two mothers in custody at that facility. In today's zero-tolerance world, these sad words seem so fresh, today's headlines. But this mother's 600 days without freedom passed long before the White House announced that brown bodies would be punished first and judged later. Like a gas leak, this emergency seeped throughout our nation until a match was lit: the family separation crisis. In Art Became the Oxygen: A Guide to Artistic Response, the USDAC argues that “emergencies demand cultural responses.” At the USDAC, we demand change through action and through art. We support the Citizen Artists whose work is rooted in the ethics of community-based art, social transformation, and truth. Michelle Angela Ortiz is one of these artists. Ortiz commits her practice to social justice through nuanced storytelling in collaboration with the communities whose voices her art amplifies. Ortiz, the daughter of immigrants, has nurtured a community-based arts practice for nearly two decades. She focuses on the stories of immigrant families, many incarcerated in migrant detention centers. Ortiz’s work is visually stunning, politically charged truth-telling steeped in hope and love. On a recent panel at the Americans for the Arts annual convention, Ortiz detailed her process of collaboration with detained migrant mothers. The needs and safety of her collaborators come first. She avoids re-victimizing her collaborators, choosing not to focus on the stories that audiences expect to hear—stories of trauma, sadness, and fear. Although stories of trauma arise naturally during their many conversations, they are not the focus. Ortiz centers conversations on migrant dreams, hopes, memories, and futures. Ortiz told me she sees her work as "an opportunity to amplify the existing voice and power of the community,” aiming “to create work that is powerful and that creates empathy so we can see the humanity in these stories." "I am emphasizing the importance of presenting the stories of families affected by detention and deportation,” “in ways that people can connect, empathize, then channel that energy into action,” Ortiz says. “I hope to build on the existing power of the families through this creative process so they can reveal themselves not as victims but as full whole human beings that continue to fight for themselves and the love of their children." Beyond their intrinsic power, the stories told through Ortiz have great beauty. Flores de Libertad is one of Ortiz’ visually stunning, creative actions featured through Monument LAB, a public art and history initiative based in Philadelphia and a collaboration with Mural Arts Philadelphia. In 2017, Ortiz led several community workshops at the Barnes Foundation in Philadelphia in which 100 volunteers created more than 1,600 paper flowers which were combined with flowers made by the mothers detained at The Berks County Residential Center. Each flower—ranging from vibrant pink to white—contained a written message of freedom. On October 25, 2017, thousands of these delicately hand-folded and hand-dyed tissue flowers were arranged into an all-caps ten-by-forty-foot expression of freedom displayed at the north gates of Philadelphia's City Hall. The creative action was accompanied by a conference led by the Shut Down Berks Coalition, demanding an end to family detention. Coordinating with community organizers and activists is essential to Ortiz’ practice. She states that her work should be “utilized in the moment as a forum to speak about issues,” and “move empathy and anger into the direction of action.” Ortiz acknowledges that as an artist with U.S. citizenship she can enter and exit a detention center with ease, freely acknowledging her privilege. Critically, Ortiz recognizes that her work “has been built on the work of my parents and ancestors.” This drives her passion to “invest my cultural currency to do this work in community." Her close attention to ethics and care for engaging with community organizers are real. “I first learn and listen with organizers on the ground to make decisions where messaging will have biggest impact,” Ortiz says, “and I acknowledge the work that’s already been done by organizers and families." Another recent work, Seguimos Caminando (We Keep Walking), featured as part of Monument Lab, also demonstrates Ortiz’ commitment to ethical collaboration and nuanced storytelling manifested in striking new-genre public art. That time-based and temporary work features stories written by two mothers detained with their children at the Berks County Residential Center for nearly two years. 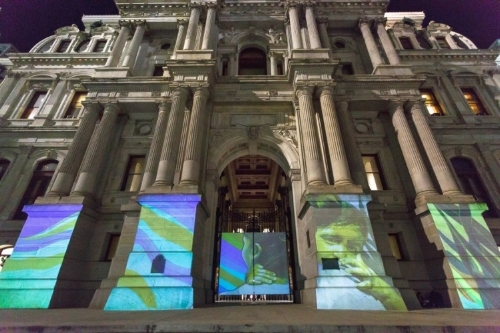 The animated projection starts with the wrought iron gates of Philadelphia's towering City Hall opening at the base of the opulent brick and marble columns while the voice of one mother echoes through city streets. The images and narrative that follow recall a detained mother’s past life in Central America and express her hope for the future. The animated images include abstracted water, feet on the sandy banks of a river, two hands outstretched and reaching for each other, the silhouette of a mother carrying a young child, the brown eyes of a woman looking toward the sky with hope, and handwritten letters in Spanish by the detained mothers demanding their freedom. The stories were authored in custody. Ortiz explained that the audio could only be recorded after the authors’ release. 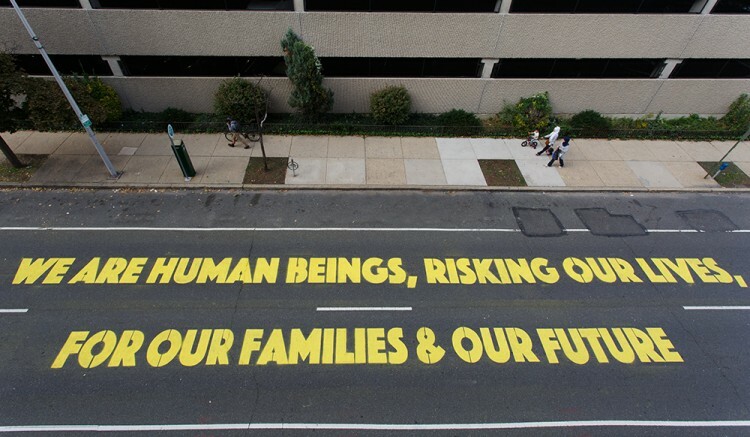 With the support of the Rauschenberg Artist as Activist Fellowship, Ortiz is currently working on phase two of her project, Familias Separadas, initiated in 2015 as a series of temporary site-specific public art works that document stories of immigrant families affected by detention and deportations in Pennsylvania. The artwork created in phase two will amplify interviews with mothers who have been released from Berks and who are either still living in the U.S. or have been deported. Together, the artist and her collaborators are sharing the message that families belong together, not in cages, but free. What can Citizen Artists learn from Ortiz's work? That artistic response can catalyze direct action if grounded in hope and love, not focusing solely on crisis and pain. We know that art and creativity can be catalyzed in protest, but must simultaneously be used to “channel care, comfort and connection” (Art Became the Oxygen). Michelle Angela Ortiz’ embodies this ideal. As Ortiz states so beautifully, "talking about love works against the agenda of dehumanization." To find out more about Michelle Angela Ortiz visit her website, michelleangela.com. Today, on Independence Day, we are asked to join in a national celebration of human rights, liberty, and self-determination. But our values are only as real as our actions, and judged by our actions, liberty is in jeopardy every day. The ongoing separation and detention of families at our southern border is a moral crisis that strikes at the root of democracy. Art & Well-Being: Toward A Culture of Health Launches! We envision a time when cultural interventions to improve personal and social health are commonplace and well-funded. Imagine not just a beautiful appearance for every hospital and clinic; not just musicians and storytellers on every ward to help people craft the narratives and move to the rhythms of their own healing. Go further and imagine never again having to argue for the necessity of beauty, connection, and purpose to well-being. Imagine the scales falling from policymakers’ eyes, allowing them to finally see that social justice heals. Imagine them investing real power and resources in that truth. Prevention: Art can shine a light on essential truths about our individual and collective well-being. Advocacy: Art can advocate for the rights of those facing health challenges. Treatment: Art can engage, serve, partner, and support those living with health challenges. To quote one statistic directly from the [WHO Commission on Social Determinants of Health 2009] report: “A girl born in Sweden will live 43 years longer than a girl born in Sierra Leone.” The mortality differentials among countries are enormous. But such inequalities also appear within each country, including the so-called rich or developed countries. Again, quoting from the report: “In Glasgow, an unskilled, working-class person will have a lifespan 28 years shorter than a businessman in the top income bracket in Scotland.” We could add here similar data from the US. In East Baltimore (where my university, The Johns Hopkins University, is located), a black unemployed youth has a lifespan 32 years shorter than a white corporate lawyer. Actually, as I have documented elsewhere (1), a young African American is 1.8 times more likely than a young white American to die from a cardiovascular condition. Race mortality differentials are large in the US, but class mortality differentials are even larger. In the same study, I showed that a bluecollar worker is 2.8 times more likely than a businessman to die from a cardiovascular condition. In the US as in any other country, the highest number of deaths could be prevented by interventions in which the mortality rate of all social classes was made the same as the mortality rate of those in the top income decile. These are the types of facts that the WHO Commission report and other works have documented. So, at this point, the evidence that health and quality of life are socially determined is undeniable and overwhelming. How do we respond to these stark realities? Art & Well-Being features three detailed case studies, dozens of project descriptions, and hundreds of links to powerful arts projects, research resources, and detailed accounts for those who want to go even deeper. A section on right relationship covers ethics, partnerships, and much more. If we actually spent just one percent of money we spend on pharmaceutical research to find a cure for dementia—which we haven’t done very well at for decades now, and it’s doubtful, I believe, that we will—one percent of that research money, if that went towards programs that fostered a sense of meaning in purpose in people’s lives, then we’d be a lot further down the road in preventing dementia, and easing the symptoms of dementia. Learn more about all of these and many other descriptions and links in Art & Well-Being, available for free download here. And please stay tuned for more information about other ways to learn and share experiences of arts work toward a culture of health, including a Citizen Artist Salon coming up this summer. When you download the guide, you’ll automatically receive updates. People across the U.S. have told us they want easy ways to connect locally through the USDAC for support, sharing, and collaboration. That’s why we started a national network of local USDAC Outposts. An Outpost is a group of four or more individuals committed to enacting USDAC values in their community. The next deadline to apply is Friday, 25 May. More info here. If you’ve been thinking about starting an Outpost in your community but have some questions first, read on for answers. If after reading these FAQs you want to know more or talk things over, we’d be happy to schedule a 30-minute call with you! I don’t know three other people in my area who want to start a USDAC Outpost. How do I connect with other Citizen Artists in my area to start one? Hold a founding meeting: invite friends, neighbors, colleagues, allies, and acquaintances to imagine and plan what your Outpost could be. And remember, start out as you mean to go on! Invite a core of people that reflects your commitment to inclusion. Extend invitations to people of all ages, races, genders, identities, abilities, and orientations. You can find more tips for forming your Outpost, including a suggested agenda for holding a founding meeting, in the Outpost Toolkit. I’m not sure I’m ready to apply by the current deadline. How often does the USDAC hold an open a call for Outposts? The best time to start is now! But if you can’t meet the current deadline, the USDAC opens applications for new Outposts three times a year, in October, February, and June. What kind of time commitment is involved once an Outpost is established? On average, Outpost organizers spend a few hours per month on Outpost work/play. We’ve provided detailed information on activities and time needs for your jumpstart project—three model project ideas and a way to create your own! We can help tailor your Outpost plans to available time and person-power, so don’t be shy about asking: hello@usdac.us. Will starting an Outpost take time away from the important cultural organizing work we’re already doing in our community? No. Outposts are here to amplify and connect what you already do and to give you access to USDAC tools and learning experiences that support your work. An Outpost already exists in my area but I don’t know how to join. Can the USDAC connect me? Yes! All current USDAC Outposts can be found here, and there’s contact info for each one. It may take more than one Outpost to serve larger communities too, so feel free to explore starting one in your neighborhood or with a special focus. If you have additional questions please reach out to us at hello@usdac.us. Does the USDAC provide funding for Outposts? USDAC does not currently provide substantial direct funding. We do provide a batch of USDAC swag, a web listing, and all the technical assistance you need to boost your Outpost’s fundraising efforts. Once your Outpost has completed your 6-month jumpstart project you’ll be eligible to apply for a micro-grant. I see that Outposts are required to do a jumpstart project within their first six months, I don’t know what kind of project to take on. Can the USDAC help me figure it out? Yes! You’ll find ideas and recommendations for jumpstart projects in the Outpost Toolkit. The USDAC also has other resources and toolkits to inspire your collective action, but if you don’t see something that fits, we’re here to help! I’m part of an existing group or organization that’s aligned with USDAC values. Can we become an Outpost? The USDAC has many Affiliates—existing organizations, coalitions, collectives, and networks aligned with USDAC values. Affiliates also get listed on the USDAC site, invited to join in Citizen Artist Salons and Actions, and linked into our social media and storytelling efforts. Check out the criteria and the simple application process here, and if you’re not clear whether becoming an Affiliate or Outpost is right for your group, feel free to get in touch: hello@usdac.us. We can set up a call to discuss it if you wish. Do Outposts have to be U.S.-based? At this time, yes. The USDAC’s focus is domestic. We’re exploring connecting some type of international network in the future, but that will take time. In the meantime, we love being in touch with colleagues and allies abroad, so please drop us a note so we can get acquainted. And feel free to use our Toolkits, Guides, and information wherever you are! Back in October, the USDAC launched Honor Native Land: A Guide and Call to Acknowledgment, calling on all individuals and organizations to open public events and gatherings with acknowledgment of the traditional Native inhabitants of the land. Since then, more than 7,000 people have downloaded the Guide and many have put it advice into practice, with hundreds signing the pledge to make acknowledgment a regular custom. Have you been hesitant about acknowledging Native lands at your event? We hope these FAQs will clear things up! I like the idea, but shouldn’t an Indigenous person be the one to offer acknowledgment? I’m not Native American. Cultural democracy—the USDAC’s animating principle—says we all share responsibility for a social order of belonging, equity, and justice. If the hard work of confronting and overturning dis-belonging and injustice is left to those most directly affected, everyone else is shirking this collective responsibility. Acknowledgment isn’t a favor others do for Indigenous people. Just like taking action to stop someone from disrespecting or insulting others on account of their gender, orientation, ethnicity, or religion, acknowledgment is a step toward cultural democracy. I’m really nervous about making a mistake. What if I mispronounce something? What if I do it wrong? The most basic forms of acknowledgment we recommend in the Guide are very simple, for instance: “I would like to acknowledge that this meeting is being held on the traditional lands of the ________________ People, and pay my respect to elders both past and present.” It is fairly easy to find the name(s) pertaining to your region. (The Guide is full of suggestions as to how to research this, connecting with local Native organizations, Indigenous studies programs at universities in your region, and online resources.) Much information is available through this online Native Land map; it is often possible to learn correct pronunciation of tribal names by clicking their links on that map. If fear of making a mistake trumps doing the right thing, we’re in trouble! If you try acknowledgment with an attitude of sincerity and humility—asking to be corrected if you stumble—most people will respond in kind. What about all the other people who lived here—the Africans who were brought against their will to the communities of color pushed out to make way for gentrification? Shouldn’t we acknowledge them too? “Every community owes its existence and vitality to generations from around the world who contributed their hopes, dreams, and energy to making the history that led to this moment. Some were brought here against their will, some were drawn to leave their distant homes in hope of a better life, and some have lived on this land for more generations than can be counted. Truth and acknowledgment are critical to building mutual respect and connection across all barriers of heritage and difference. What about more than an acknowledgment: a prayer, ceremony, or performance? Is it okay for me to try for that? There are many possible steps beyond acknowledgment. All should be offered by Indigenous people. When members of one Native people visit the territory of another, they may engage in a formal exchange of greetings, gifts, and blessings. Artists or spiritual leaders whose tribe’s traditional lands are the site of your event may be invited to offer a traditional cultural protocol or to acknowledge ancestors with a song, prayer, or ritual. Whether you are non-Native or Indigenous, it is perfectly fine to reach out to local Indigenous organizations or individuals with an invitation like this, so long as it is done respectfully. It is important to offer an honorarium or gift as appropriate to the individual elder, artist, or spiritual leader invited to take part in this way. You say “Acknowledgment by itself is a small gesture. It becomes meaningful when coupled with authentic relationship and informed action.” What kind of action? I’m worried that we will be asked to change our programs or staffing or governance in ways I can’t make happen. Higher-ups could be upset if I open the door to requests they won’t grant. The USDAC understands acknowledgement as a beginning, a possible opening to greater public consciousness of Native sovereignty and cultural rights and toward correcting the stories and practices that erase Indigenous people’s history and culture, toward inviting and honoring the truth. To bring about equity, belonging, and justice, things have to change. The first steps toward that culture shift are awareness of what has been and what could be and public acknowledgment of those realities. For non-Native organizations, entering into dialogue and relationship with Indigenous people calls for respect and reciprocity, deep listening and truth-telling. There is no immunity from facing these truths. Let us help you strategize about how to proceed: contact us at hello@usdac.us. We would love to hear about your experience with acknowledgment. A future blog will feature acknowledgment stories from across the U.S. Please share texts, photos, or any other material you like that will help others understand your own process of acknowledgment. Just write to us at hello@usdac.us. We’ll ask your permission before using your experience in a future blog post. What Does A #RevolutionOfValues Mean to YOU? #RevolutionOfValues 2018, the second USDAC National Action honoring Dr. Martin Luther King, Jr.’s memory and message, just launched. What #RevolutionOfValues is needed now? #WhatWillYouStandFor? And how will you stand: by performing Dr. King’s words, making visual art that embodies his message, bringing people together to share resonant stories of what needs doing and what has been accomplished? The free downloadable Toolkit offers guidance on all of these. These questions are especially poignant when we consider Dr. King’s courage in standing on April 4, 1967—one year to the day before he was assassinated—to deliver a talk entitled “Beyond Vietnam: A Time to Break Silence” at a meeting of Clergy and Laity Concerned about Vietnam, held at Riverside Church in New York City. [W]e as a nation must undergo a radical revolution of values. We must rapidly begin the shift from a “thing-oriented” society to a “person-oriented” society. When machines and computers, profit motives and property rights are considered more important than people, the giant triplets of racism, materialism, and militarism are incapable of being conquered. Dr. King’s remarkable oratory—so eloquent and unflinching—reminds us of the power of the word in the service of love and justice. He was many things, but one that isn’t often mentioned is this: a spoken-word artist for the ages. Many of the actions described in the #RevolutionOfValues Toolkit invite you, Citizen Artist, to follow in his footsteps. What #RevolutionOfValues is needed now? #WhatWillYouStandFor? For the USDAC, #RevolutionOfValues resonates with our core aim of culture shift, a paradigm shift from an old, inadequate understanding to one which captures our real challenges and possibilities. Citizen Artists are working for a shift from a consumer culture to a creator culture, from a policy based on privilege to a cultural democracy—a true #RevolutionOfValues. What is yours? The Toolkit gives instructions for submitting art for the gallery and uploading images and texts to social media, as well as planning and hosting #RevolutionOfValues events. Start planning now! Taking part in a National Action can build awareness and mobilize action in your community. It can connect you with Citizen Artists and groups across the U.S. who share your values and hopes. And it can inspire others in ways you never dreamed. For instance Did you read about The Kudzu Project here this past December? Guerilla knitters in Charlottesville, VA, were inspired by a postcard created by Citizen Artist Dave Loewenstein for last year’s #RevolutionOfValues. Scroll down on this page to see and download a gallery of images created last year, including Dave’s “Defunct Monument” series, then follow the Toolkit instructions to submit your own. Who knows what your vision could catalyze? History always constitutes the relation between a present and its past. Consequently fear of the present leads to mystification of the past. The past is not for living in; it is a well of conclusions from which we draw in order to act. There are plenty of people out there mystifying—whitewashing—Dr. King’s history out of fear of a present in which in growing numbers are calling for the true revolution of valued he espoused. There has been a movement to #ReclaimMLK from the “innocuous rituals of civic engagement” his birthday celebrations have become, reviving his radical message. #RevolutionOfValues is part of that movement. I like to visualize each of us as a link in a chain of souls, the connector between three past generations and three generations into the future. Everything we find worth knowing comes to us as part of the legacy inherited from the dead, sharpened to speak to the present. What will you find worth teaching to the next generation, who will teach the next, who will teach the next? #WhatWillYouStandFor? As part of last year’s #RevolutionOfValues, USDAC folks made a video in which each of us spoke a few lines excerpted from the Riverside speech (scroll down and you’ll see it on this page). Cultural Agent Emmet Phillips takes his responsibility to future generations very seriously. Using that same script (available in the #RevolutionOfValues public folder you’ll be able to access when you download the Toolkit) he made a video with young people from the Children and Family Urban Movement in Des Moines, IA, where he works. Here’s a link to the video on Facebook: watch it and be inspired! The Office of Instigation (OOI) is the USDAC’s Organizing Team—the folks who plan and coordinate our national actions, shepherd our communications, cultivate partnerships, raise funds, connect and grow the network of Citizen Artists, create resources and learning opportunities, and do so much that’s needed to sustain and amplify the people-powered department’s work. Today we are delighted to introduce three new people who are joining Chief Instigator Adam Horowitz and Chief Policy Wonk Arlene Goldbard in the OOI; and to express our gratitude to those who have given so much and are now moving on. Minister of Collaboration and Activation Gabrielle Uballez is a cultural organizer, educator, and art omnivore. Her passion for equitable arts access is rooted in 20 years of experience, at every level, in community-based arts and platforms that support artists of color. She most recently served as the executive director of Working Classroom, a grassroots arts organization of which she is an alumna. Gabrielle will be working full-time on the USDAC’s organizing efforts, reaching out to Affiliates, Outposts, and in all the many ways individuals and organizations make the USDAC work for their local communities and for cultural democracy. "I knew I had to be a part of the USDAC when I saw the visionary Cabinet and network of affiliate organizations and Citizen Artists,” she told us. “These are people I will roll up my sleeves with to build a nationwide, grassroots movement toward cultural equity and belonging!" Gabrielle has served at and is associated with: the Studio Museum in Harlem; Crescendo Cultural at the National Museum of Mexican Art; the Western States Arts Federation Emerging Leaders of Color network; the National Association for Latino Arts and Culture Leadership Institute; the Creative Facilitation Gathering design team at the Academy for the Love of Learning; apprenticed under chef Zarela Martinez; grant panelist for the National Endowment for the Arts; and served on local community boards. Gabrielle received her B.A. in Art and Art History from Pomona College and a certificate from Stanford University’s Graduate School of Business Executive Program for Non-Profit Leaders. She is a proud Latina, wife, and mother of a Chinese-Chicanx child, currently living in her hometown of Albuquerque, New Mexico. Tiffany Bradley is the part-time Chief of Implementation, helping with systems and social media to ensure that all of the USDAC’s moving parts work together. Her career reflects her lifelong love of the arts across disciplines and cultures. She is the founder of Colored Criticism, a media platform for cultural heritage stories. Her focus is intersectional, interpersonal, and interdisciplinary. Tiffany has worked in audience development at Race Forward, Americans for the Arts, and Fractured Atlas. Her writing has appeared in The Nation, Colorlines, Racialicious, and the Americans for the Arts blog. As a Fulbright scholar in Museum Studies, she worked with a variety of nonprofits in Israel and Palestine. She has studied at the American University in Cairo, the University of Haifa, and Al Quds University. Tiffany holds a B.A. in Africana Studies from Brown University. "Since my first encounter with the USDAC,” said Tiffany, “I've known this group was committed to equity. I'm looking forward to connecting Citizen Artists across the country through social media, in-person events, and more!" 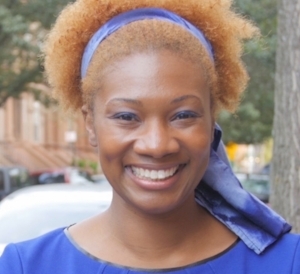 The USDAC is thrilled to be in a consulting relationship this year with Minister of Abundance Ericka Taylor, a writer, facilitator, and consultant based out of Washington, DC who has been helping us explore and develop systems that individual donors, foundations, and other funders can use to support the people-powered department’s work. Born and raised in Nashville, TN, Ericka has spent the bulk of the last 20 years working for social justice organizations. Her career has spanned community organizing, philanthropy, and fundraising. She earned her BA in English from Cornell University and an MFA in Creative Writing, with a concentration in fiction, from the Inland Northwest Center for Writers at Eastern Washington University. She has served as a member of the Board of Directors or Steering Committees of the National Organizers Alliance, Progressive Technology Project, Youth Education Alliance, and the National Priorities Project and is currently a board member of the Western States Center, and La Clínica del Pueblo. Welcome new OOI members Gabrielle, Tiffany, and Ericka! Please join us in expressing heartfelt gratitude to our colleagues whose USDAC tenures are ending. Mo Manklang, who has been USDAC Chief of Making Things Happen since late 2016—and has made so many things happen, from organizational systems to social media to our website redo—has been loving her work in Philadelphia as Communications Director with the U.S. Federation of Worker Coops so much, she’s made it full-time! This isn’t goodbye, because we hope and trust Mo will stay active and engaged as a Citizen Artist. Feel free to stay in touch with Mo at mo@usworker.coop, and follow her on Twitter @momanklang. A year of piloting our Regional Envoy model— three individuals reaching out on behalf of the USDAC in multi-state regions—taught us that we need more firmly established central infrastructure to scale sufficient resources into organizing and engagement at the regional level. Envoys Devon Kelley-Yurdin in the northeast; Yvette Hyater-Adams in the southeast, and Katherin Canton on the west coast have assisted local cultural organizing, offered workshops and trainings, researched local cultural development needs, and connected people to USDAC National Actions, all the while learning and growing together. We are grateful for their creativity, commitment, and critical contributions to the USDAC over the last year as we piloted something new. Their experience will be invaluable to our incoming Minister of Collaboration and Activation, and we look forward to connecting regularly with these powerful Citizen Artists. You can too! Find Devon at devonkelley-yurdin.com, via email at devon.kelley.yurdin@gmail.com, or on Instagram @moodhair. Reach Yvette at YHyater@gmail.com or by phone at (904) 372-3771. And find Katherin via LinkedIn: www.linkedin.com/in/katherincanton or on Twitter @streetscapes_KC . Thank you Mo, Devon, Yvette, and Katherin! May the next steps on your path lead exactly where you want to go!